Are you depressed? Is the world getting you down? Why not pay a visit to the website www.DepressionCanBeFun.com which is a genuine website, not a spoof! The website author says... "Get up and get moving. Lift Your Mood, NOW! 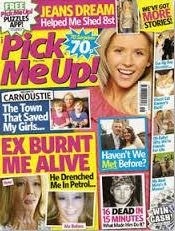 Quick, easy ways to stop feeling blue…"
"EX BURNT ME ALIVE - He Drenched Me in Petrol..."
The magazine also included some lurid up-close "Before" and "After" photos of her burnt face on the front page. Note the article on the mass killing.. "16 DEAD IN 15 MINUTES". If you weren't depressed before, you will be after you read this magazine.